…we cannot leave the reins of our future to the so-called grassroots. We need a new conversation and a different approach. We need to save the grassroots of Nigeria from itself, and save the future of Nigeria from the grassroots. How it shall happen, I don’t know. What I know is for as long as we depend on the grassroots such as we have, there is no hope for Nigeria. I had given the Independent National Electoral Commission (INEC) a pass mark after the presidential election. But by the second round of elections for State governors and Houses of Assembly, I drastically reviewed my position. However the entire charade of elections is not an issue for INEC alone. The elections were watered by the blood of the innocent as usual. Some people said Nigeria lost more innocent souls in 2011 and 2015 than we lost in 2019 but this claim is hard to verify. What seems more likely is that Nigerians now feel less shocked than before at the idea of people dying during elections, and indeed most people paid no mind to the general carnage around them. The gubernatorial and state assembly elections showed that we have lost a lot more of our humanity since the last general elections, that Nigerians lives have become devalued and that more of our humanity is eroding. To corroborate my position about who we have become, I recently read a statement from the INEC chairman, wherein he said the violence in the 2019 elections was somewhat alarming and unprecedented. Straight from the horse’s mouth. I predicted quite rightly that the guber and assembly elections will be a lot dirtier for several reasons, including that unlike the presidential elections where attention was focused on two major players, this time, there were many desperate governors, aspiring governors, assembly members and the ‘honorables’ who were trying to displace them, that the whole country may collapse into a free-for-all. Also, with the presidential election, many of the players – such as governors – worked for Buhari, who promptly threw everybody else under the bus and watched them roast subsequently. So it became a brutally selfish game; a blood sport. Guys were willing to kill, maim and destroy to get their hands on some of the action. The news and events around the second set of elections were shocking and sad, and cast a pall on the entire elections. The Kano State rerun is an example. It was an out-and-out case of blatant robbery, which merely amplified what the whole general election cycle stood for. Even the All Progressives Congress (APC) stalwarts were complaining that ‘Gandollar’ pocketed the entire system and unleashed different kinds of violence. On that day, the yandabas of Kano came out in full force and determined the next four years for the people. Still it will be simplistic and patently wrong to blame it all on INEC. This is where the ‘grassroots’ come in. We who are new entrants in politics and who stepped out this season, have been told by the entire country to ‘go and engage with the grassroots first’ as a sure strategy for electoral success. That is the cheapest statement to make actually. It’s not as if we did not try. I actually recall being duped by many so-called ‘grassroots’ people across the length and breadth of Nigeria. I recall many instances where fly-by-night ‘supporters’ came out of every crack in the world promising to deliver this and that, or swearing that without them no one can get any vote. Almost every pub-crawling Nigerian is a youth leader, even if they were septuagenarians. I often had the sense that these guys were in a permanent mode to milk politicians. I am not sure they truly like any politician but see them as mere meal tickets. Luckily, I am one of the pragmatic few who never got carried away or thought I could win the presidency. ‘When did I start that I would just win like that?’, I constantly asked myself. For me, it was never about winning but about making impact on policy and using the pedestal and elevated platform and visibility offered by my candidacy to project some ideas, some of which are now being taken serious or echoed in high places today (such as the oil palm versus crude oil comparison, the small growth rate of our GDP, our dismal budget size and so on). In fact, I finally received a singular reply to the many letters I wrote in that season, from the Office of the Vice President, which was the only reply out of about 30 letters written to different exalted offices in the land in that period, emphasising these issues. The grassroots in Nigeria do not care about debates and think nothing of ideas. The grassroots are perfectly okay with electing and reelecting those who have put them where they are, and complaining all year long till the next election cycle. The grassroots do not mind being the grass upon which Nigeria’s elephants trample, sometimes for a small fee. We engaged with the grassroots. We courted them in some instances. Sometimes we believed in them. But many people at the grassroots set out simply to dupe and to defraud us. Some of them have taken that stance perhaps in furtherance of the agenda of the status quo i.e. to ensure they ruin those little guys that are just coming up so that no one will ever think of standing up to the status quo ever again. For others, they were just on the lookout to maximise their take from the elections by collecting from every and anyone, and then supporting the status quo or status quo ante (APC and PDP), which are parties that give enough space for expression to all sorts of tendencies, some of which may not find accommodation in the more idealistic small parties. The big parties, for example, have elevated motorpark touts and local cults, but many small parties are afraid of those types of people. Yet for others, they are just so angry, so disconnected from the Nigeria project that they couldn’t care less what the outcomes are, and anyone that could be duped is fair game. The final result of our 2019 elections showed that indeed, only a few of the NEW parties hold the hope for a sane future for this country. Without our involvement, there would have been zero debates and certainly no focus on any of the issues that matter. After all, at the federal level and in most states, the Peoples Democratic Party (PDP) and APC pointedly shunned debates and offer no clear solutions to any of our problems. Already, the complaints have started. The grassroots in Nigeria do not care about debates and think nothing of ideas. The grassroots are perfectly okay with electing and reelecting those who have put them where they are, and complaining all year long till the next election cycle. The grassroots do not mind being the grass upon which Nigeria’s elephants trample, sometimes for a small fee. As a matter of fact, the grassroots need saving from themselves and the fate that they have led this entire country into. The grassroots do not need cajoling, spending on, wooing, except if you have stolen money that you are willing to launder through the political process, invest now, and collect later at an undetermined stratospheric rate of return. That will also mean you are in politics for the wrong reasons; to create a political career in Nigeria and generally join the rest of the crew in kicking the can down the road while things get worse. Many who talk about the grassroots do not know how bad the problem is. I even made a note to ask my friends who were in confraternities in university how and why those school cults they created have now become what primary school pupils, area boys, agberos and whatnot, belong to. The grassroots of Nigeria is run by cults and warlords. This is what happens in a troubled society. 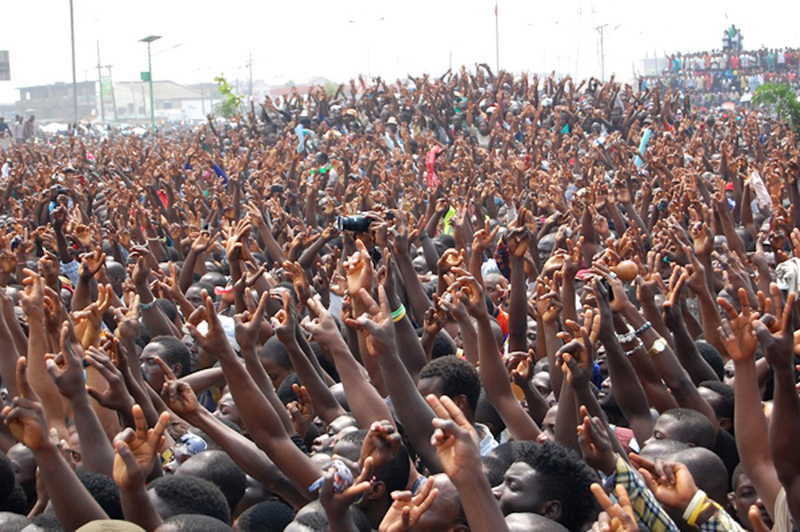 For Nigeria to survive, the grassroots cannot dictate the pace or direction. You can only offer what you have, and lead people to where you know. See the way one lady holding a camera exposed the skin-crawling travesty that is Okotie-Eboh Primary School in Sapele, Delta State? That lady is probably social media savvy. Their types hardly vote. But those who vote don’t see anything wrong in living worse than animals, being trampled upon, degraded and devalued. We respect them. But we cannot leave the reins of our future to the so-called grassroots. We need a new conversation and a different approach. We need to save the grassroots of Nigeria from itself, and save the future of Nigeria from the grassroots. How it shall happen, I don’t know. What I know is for as long as we depend on the grassroots such as we have, there is no hope for Nigeria. Our grassroots need help; from poverty and want, illiteracy and hopelessness… Surely we cannot saddle these poor folks with the mathematical and futuristic equation of determining what Nigeria’s future should be. I will close by recalling how much Plato and Socrates hated democracy, and called it ‘mob rule’. Nowhere else on earth could it be truer that democracy equates mob rule than in Nigeria, the country with the highest levels of illiteracy and poverty in the world. Socrates fell into conversation with a character called Adeimantus and tried to convince the latter about the flaws of democracy by comparing a society to a ship. “If you were heading out on a journey by sea who would you ideally want deciding who was in charge of the vessel? Just anyone or people educated in the rules and demands of seafaring?” “The latter of course”, says Adeimantus, to which Socrates responded: “So why then do we keep thinking that any old person should be fit to judge who should be a ruler of a country?” Socrates was of the view that voting in an election is a skill, not a random intuition. And like any skill, it needs to be taught systematically to people. Making people vote without that education is equivalent to leaving complete novices at the captainship of a ship in a storm. Does this not say everything about Nigeria? Illiteracy. Deliberate. Perennial. Poverty. Highest levels in the world. Those are the key words. Of course Plato, Socrates’ mentee, did not make things comfortable. He traced a process where democracy will lead to the production of tyrants. That said, I admit it is tough to find a better form of government. And I am not asking for the disbandment of our still ‘nascent’ democracy. I am only saying that the investment in the stability of our nation, required by democracy, should be urgently prioritised. For the good of all of us. Our grassroots need help; from poverty and want, illiteracy and hopelessness… Surely we cannot saddle these poor folks with the mathematical and futuristic equation of determining what Nigeria’s future should be. The enlightened, the well-traveled, the exposed, the educated, the fortunate, the intellectual, the intelligent, the comfortable, the middle-class, the thinking type, will have to necessarily find a way of coming together to save the nation hurtling to its own dismemberment. ‘Tope Fasua, an economist, author, blogger, entrepreneur, and recent presidential candidate of the Abundant Nigeria Renewal Party (ANRP), can be reached through topsyfash@yahoo.com.